As one of the first female bank officers in the state of Nevada, Selma Bartlett has been instrumental in tremendous growth of Henderson over the last fifty years. Bartlett moved to southern Nevada in February 1954 when her husband was stationed at Nellis Air Force Base. She earned a degree from Hill Business College in Oklahoma City in 1945 that quickly was put to use as she began to work in Henderson. Bartlett began working for Bank of Nevada at its Henderson branch in 1954, shortly after it was established. In 1958, she made history by becoming one of the first woman bank officers in Nevada. She made history again in 1962 when she was promoted to bank manager of her Bank of Nevada branch. Bank of Nevada merged with First Interstate Bank and Bartlett continued her service with First Interstate Bank for more than forty years. Bartlett and First Interstate Bank promoted the growth of Henderson through a residential feasibility study that encouraged development in the area. She was also a friend of industry in Henderson, calling for titanium tariffs in the 1960s to help the local titanium producer, TIMET. Bartlett’s passion for banking extends to her personal life. She belonged to National Association of Bank Women and served as their regional vice-president between 1958 and 1960. 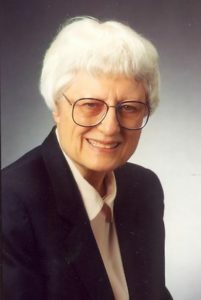 She brought her banking knowledge to others by teaching for the American Institute of Banking from 1979 through 1982. Recognition for her contributions to the Henderson community have come from the Henderson Chamber of Commerce and the City of Henderson. Her membership in a number of civic organizations including the board for St. Rose’s Dominican Hospital, Henderson Boys and Girl’s Club, and the Henderson Development Association illustrates Bartlett’s dedication to her community. In 1992, the Clark County School District recognized Bartlett’s importance to her community and named an elementary school in her honor. Bartlett was a senior vice-president with BankWest of Nevada until her retirement.